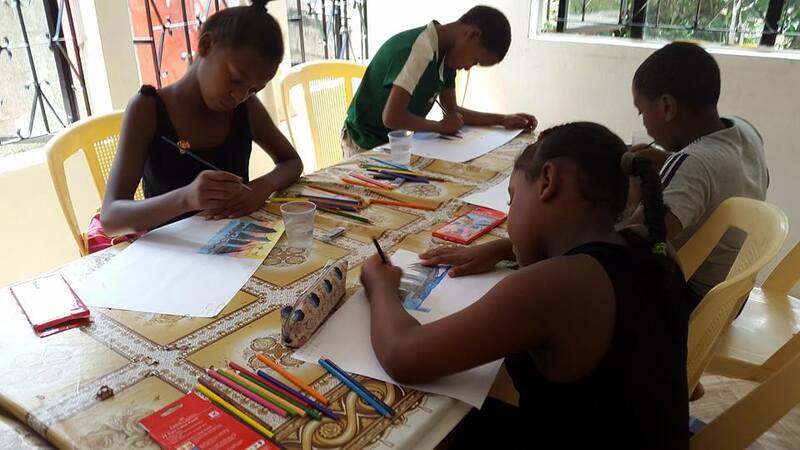 It’s been more than three months already that ELI Africa started its Visual Arts classes at its Roche Bois ELI Center. Dhanisha Geerdharry joins us to talk about how her passion is revolutionizing the concept of education in Mauritius. According to Dhanisha, the Visual Art classes have allowed the students to discover their passion for painting and to identify techniques and strategies to adopt to paint and draw. “Some students are really good at drawing and they have a great sense of observation”, she adds. However, she points out that due to the heavy and competitive school curriculum the students are unable to pursue their passion and they have not been initiated into the real thing. Unfortunately this does not ensure the holistic development of the child and this kills the very essence of education. Recently, Dhanisha taught the students how to use the palette knife to create a background and hence, a painting. In the coming months, the class will be made more interesting and students will be encouraged to participate in outdoor activities. What’s fun about these activities is that the children will neither use pencil nor paintbrush during these activities. They will be shown how to play with colors while using special techniques to create beautiful designs on paper. Dhanisha is currently collecting the paintings made by the students. She hopes to hold an exhibition soon where the parents will be invited to appreciate the work of their ward. Previous StoryA Lion’s Lair Next StoryLearning the geography of our Island the ELI way! Very nice voluntary job from you my child, May god bless you. Keep it up. Indeed great job... Nowadays everyone is focuss on only having big big academic certificate n thus our children are forget ting their childhood n they sit in front of big big book n read read n read but no one ponder that our children no more play. They no more run. They no more laugh. They don't develop their personality n hence parents pressurize them n demand that their children come out first in school. And results could be seen we have robotic youngster n when pressure increase our children just commit suicide... I think these type of activities should be enlarge to more n more children. Good job n good continuation. this is indeed a great job that ELI Foundation is doing. Nowadays, our children are so busy with their academic studies that they forget to play. We, meaning, parents, Teachers are just pushing our children in books and what we all say to them :"You must come first and with flying colours in your class" but no one says " I want you to be a good human being with good manners" Nowadays children just forger their childhood because there are so much to study and hence latter forger to play and thus we are all responsible for the worsening of our future generation.....children are getting more stressed and with the recent cases of suicide is a clear cut example.... Hence with these type of extra curriculum activities, I hope that it can help of kids to develop their talent, hence lessen the burden of stress. Keep it up and please do not stop these extra curriculum activities.